Druhé pokračování rytmické dotykové hry REFLEC BEAT je na světe. Nese podtitul limelight. Nově přibyl třetí typ noty …. Nový světlý vzhled je tak trochu jako dvojka JuBeatu. 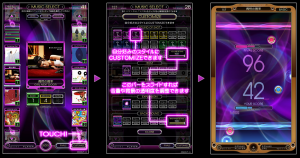 Nový ReflecBeat má nějaký „puzzle tweet“, který umožňuji Tweetování přímo z AC (viz Twitter @rbllloc). EA nefunguje (klasika na test lokacích). Další informace o test lokaci. Na hudební hru Reflec Beat existuje spousta písniček i z jiných hudebních her. 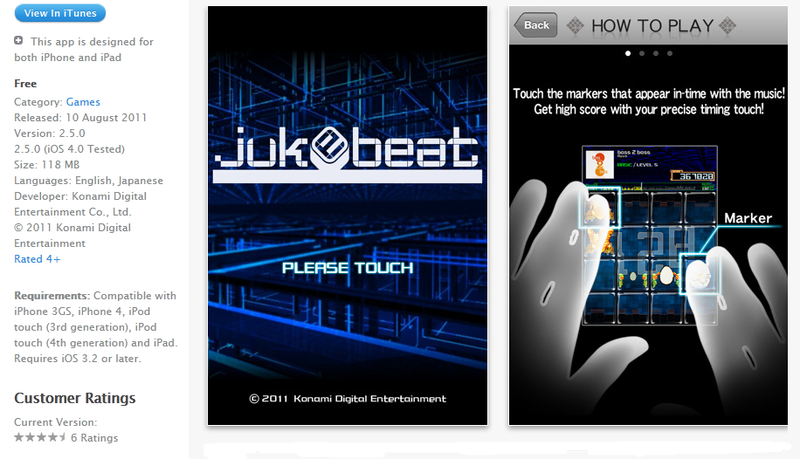 Třeba z Beatmanie IIDX, JuBeatu ale i z DDR. 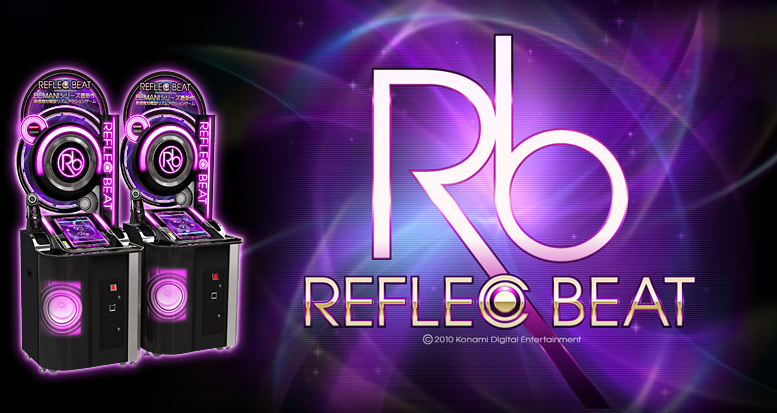 REFLEC BEAT, Konami’s newest arcade entry in its popular BEMANI franchise, is making its way into arcades across Japan this week and has had its official website published. The game is played using a touch screen equipped on the cabinet. A judgment line appears at both the top and bottom portions of the screen (one for each player) and notes will fall to this judgment line in time with the music. By hitting these notes at the right location on the judgment line, players „reflect“ them back to the other player (Which can be either a computer or human player) who must in turn „reflect“ them back. Points are given (or taken away) based on how well a player times their hits and the player with the most points at the end of the song wins the round. There are several different note types, or „objects“ as the game calls them, that the game uses and they are listed below. GOLD OBJECT: The most common note type. When a player hits this object, it is reflected back to their opponent. BLACK OBJECT: These note types will disappear when the player hits them and will not be reflected back to their opponent. LONG OBJECT: When these notes come, a player must hit the object and keep their finger in position until the tail of the object has reached the judgment line. CHAIN OBJECT: These types of notes are „chained“ together and will fall to the judgment line at the same location. Players will need to „double-tap“ in order to hit both notes. 2TOP OBJECT: These types of notes will only appear on higher difficulty levels. The game will introduce four markers, two above each players judgment line, where 2TOP OBJECTS will fall and the player must touch the necessary marker in order to score points. The game also uses a „JUST REFLEC“ gauge to add in an extra spice to the gameplay. 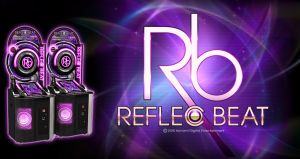 When a player successfully hits a note, their „JUST REFLEC“ gauge will fill up. Once the gauge has been filled, players will be able to use „TOUCH & SLIDE“. To do this, the player hits the note and then slides it with their finger, causing it to reflect to their opponent in an erratic manner, making it harder for them to successfully hit. 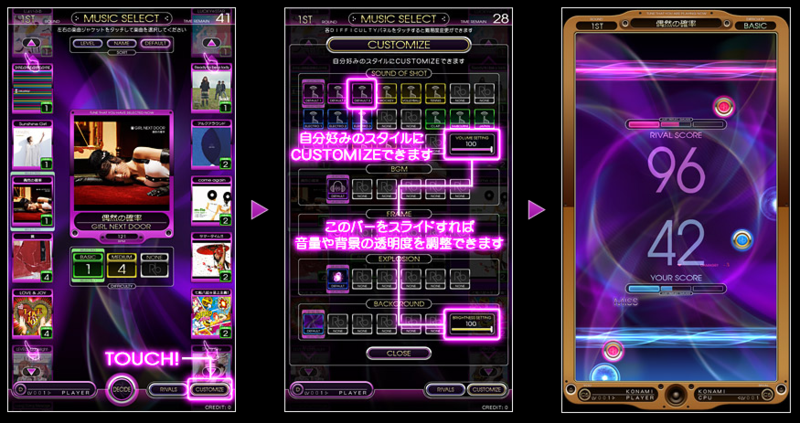 There are three gauges, so players can store their slides for later use. If you’re still confused about the basics of the gameplay, take a look at the tutorial video that Konami has put up which we have embedded at the end of this article. 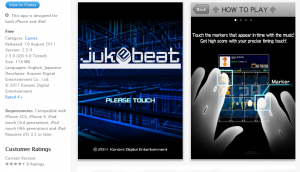 REFLEC BEAT’s songlist consists of many popular Japanese licenses (most of them being their master recordings), BEMANI crossovers, and Konami originals made for the game. The starting songlist, along with a few of the known unlocks, is listed below.